Foreign caregivers are godsends to parents with odd work hours and no family support. But it’s no longer a cheaper option for Canadian families. Growing up, Natalie Mukherjee and her sisters were cared for by Filipino nannies. Her family had two Filipino nurses taking turns to look after their late grandmother. Now a mother of three, she gets help from a Filipino live-in caregiver. With Ottawa set to start public consultations on the future of the caregiver program, Canadian families say the demand for foreign caregivers, especially in suburban Canada, is as great as ever. Earlier this month, the federal government announced the current caregiver program will expire in November 2019 after a five-year run. The news has raised questions among families and caregivers about the future of the popular program. “We have an aging population and are caught up in a generation where our parents are still working and our kids can’t rely on their grandparents,” said Mukherjee of Markham. She and her husband, an accountant, have two daughters and a son, all under 7 years old. Canada’s caregiver program is unique because it allows a group of what are generally considered “low-skilled” migrant foreign workers to become permanent residents, along with their families, based on their commitment to work as full-time caregivers for a minimum of two years. The access to permanent status was bait, in the past, for the workers to leave behind their families back home and work as live-in caregivers in Canada — a hard-fought right by the “Foreign Domestics Movement” in the 1980s. Other low-skilled temporary foreign workers such as farmworkers do not have such access to permanent residency. However, in 2014, Ottawa introduced what it called “two new pathways” for caregivers by removing the live-in condition as a way to eliminate potential work abuse and exploitation, though many caregivers continue to live with their employers because they can’t afford transportation and rent to have their own place. Earlier this month, Immigration Canada announced the caregiver program is under review and those who have not accrued two years of employment by Nov. 29, 2019 will be ineligible for permanent residence. The announcement has created a buzz among caregivers and their Canadian employers. 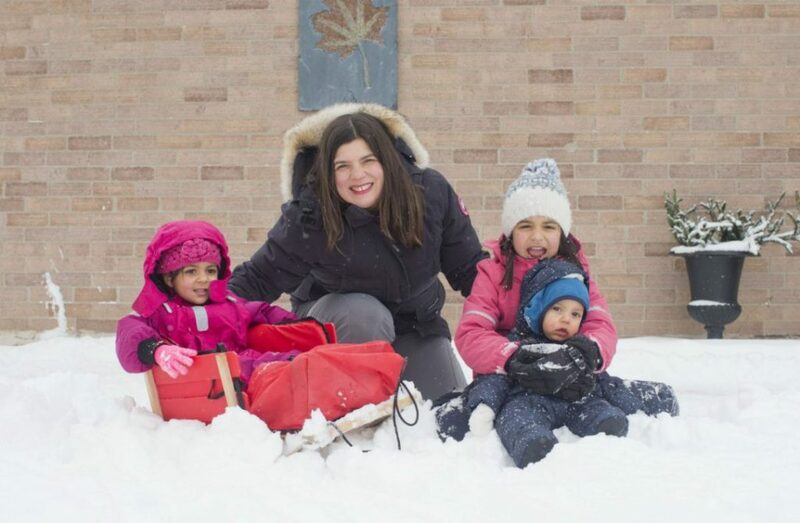 “People do feel blindsided,” said Ilana Katz, an Aurora mother of two, whose caregiver just arrived from the Philippines last October and would have to go without a vacation in order to make the 2019 permanent residence cut-off. A speech pathologist who works from a home office, Katz said there is no infant child care in Aurora and the family had been unsuccessful in finding a local caregiver. Only two Canadians responded to her ad — one could only work until 4 p.m.; the other didn’t want to commute from Toronto. The family ended up hiring a part-time au pair, a girl from France, who was in Canada on a working holiday visa for a year before paying an agent to hire a foreign live-in caregiver to look after their two young daughters, Maya, 4, and Noa, 2. Ontario’s commitment to create 45,000 new daycare spots doesn’t help families like Katz’s. “We need daycare during non-daycare hours. No one wants to come to Aurora to work for us,” said Katz, who often has clients coming to her after school or on weekends. Her husband, an apprentice in trades, works long hours and is busy with his studies. Having hired and employed four foreign caregivers over the last 10 years, Joele Tan said the program, whether it’s the old live-in caregiver program or the revised one in the last few years, has been a mess. Tan said many foreign caregivers would leave their sponsored families for “factory and Tim Hortons jobs” as soon as they get their open work permits and commence the permanent residence application process. While she does not object to granting permanent residence to caregivers, she says the two-year employment requirement should be expanded to four to allow families the stability they need and save them from the bureaucratic nightmare of having to hire a new caregiver every two years. A string of changes to the process has also made it more expensive to hire and employ foreign caregivers, said Tan. Employers said Ontario’s minimum wage hike to $14 from $11.60 last year — and to $15 in 2019 — has made many families in the province reconsider using the caregiver program. Nathalie Cansino, whose nanny came in 2016, said the higher minimum wage has pushed the cost of foreign caregivers much higher, despite what she calls the “convenience factor” of having someone live-in. Without her caregiver, she said she would need to spend $1,700 on infant care for her 2-year-old son and another $500 on after school programs for her 4-year-old daughter. The federal child care tax credit is really just a drop in the bucket on how much families invest in their children’s care, she said. “Ontario’s minimum wage raise makes the caregiver program not a cheaper option. Hiring a live-out costs you $15, $16 an hour,” noted the transportation system manager, who must arrive at work by 7 a.m.